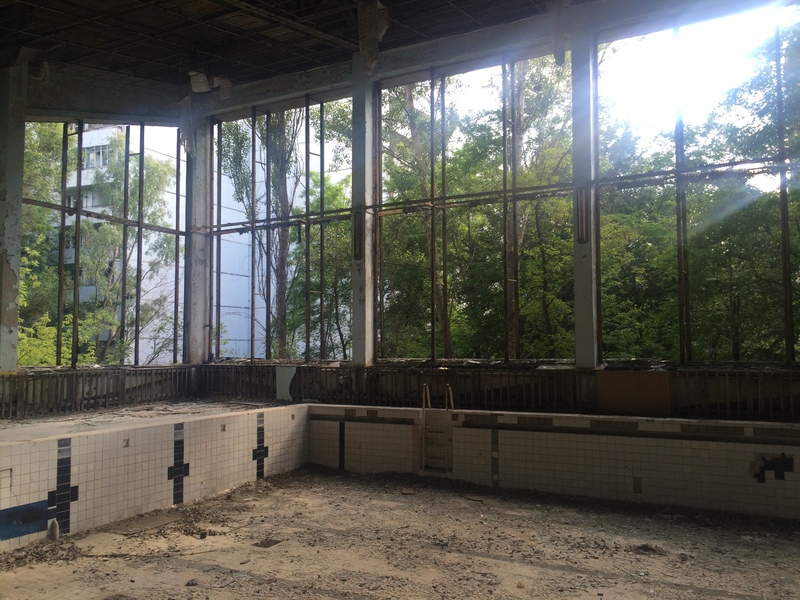 Almost a year ago, in June 2016, I visited the Chernobyl exclusion zone with a fitted dust mask in hand and little idea what to expect. At the time it was thirty years and one month since the Chernobyl accident, which occurred on April 26, 1986, but the amount of information I did not know about Chernobyl unsettled me. The reason I was able to visit Chernobyl is due to the wonderful program that the University of York in the UK, with funding from the Leverhulme International Network, has been running since 2013. Called Exploring Russia’s Environmental History and Natural Resources, the program, led by David Moon, has provided resources for graduate students and senior scholars from many different disciplines to network and visit sites that are crucial for Russia and Eastern Europe’s environmental history. In the past four years, the group has met in St. Petersburg, the Solovetskii islands in the White Sea, Lake Baikal in Siberia, and Chernobyl and Kiev in Ukraine. I participated in the Chernobyl meeting. The first thing I discovered was just how close Pripyat is to Kyiv. Only 111 km separate Kiev—currently a city of nearly 3 million people—and the location of the Chernobyl accident. To contextualize that for Canadian readers, the same distance separates Peterborough and Toronto. Peterborough does not have a nuclear reactor, but if we look at real Canadian reactors, it is more or less the distance between Darlington or Pickering Nuclear Generating Station and Buffalo, New York. It is closer than the distance between the Bruce nuclear plant and Toronto, or even Kitchener and Guelph. It is about the distance from the Gentilly Nuclear Generating Station to Quebec City. In sum, it is close. It is so close that even people born and raised in Kiev who were on the same trip were shocked by the proximity. Something that seemed so distant was merely a short drive away. It is even closer to the border of Belarus where most of the fallout landed. Second, it turns out that the Chernobyl plant did not stop producing power in 1986 with the accident at reactor 4. In October 1991, there was a fire in reactor number two, after which the reactor was shut down, but the plant still produced power from its two other reactors. Reactor one continued operating through 1996, and in 1999, Ukrainian President Leonid Kuchma finally shut down the last operating reactor, number three, over 23 years after the Chernobyl disaster. Until that time, reactor three continued to produce power. Nuclear power plants, of course, need humans to operate them. And so people worked in close proximity to reactor four to run these plants until seventeen years ago. The idea of people working in the zone of exclusion brings me to my third point, which is that Chernobyl, the city, is not abandoned. The abandoned buildings between the first checkpoint and the town belie the activity humming in the center. Though my tour group and I were covered from neck to ankle as per the safety guidelines our guide gave us, the workers of Chernobyl walked around in summer dresses and t-shirts. (Of course, we were going to Pripyat and so needed the extra protection.) 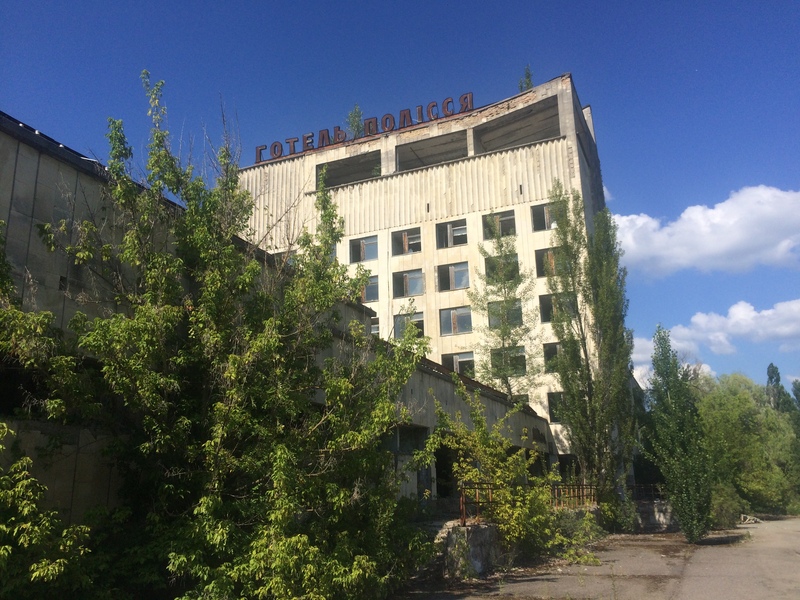 I did not know there were people who worked in Chernobyl—a city that many think of as abandoned, much like Pripyat—to keep the city and the zone running. There was a hotel where we spent the night (some of us, myself included, awoken by wolves howling) and a cafeteria where we ate. There were also guards, administrators, and tour guides. Our tour guide informed us that people who worked in the zone received extra pay, and had strict guidelines for how long they could be within it (e.g. five days in, two days out). Though I had heard of the babushky and samosely, or resettlers, I did not think there would be young and middle-aged working people in Chernobyl. Our guide was not much older than 20. I was even more surprised that there were people who worked in and around reactor four. These were the construction workers building the new sarcophagus, an amazing feat of construction that was just moved into place on November 29, 2016. These people, we were told, take the train out of the zone every night. They can only spend the workday there. It is too contaminated for them also to spend the night. Finally, I was shocked by how little is actually known about the zone of exclusion and the aftermath of the accident. Before visiting Chernobyl, I spent a day in Kiev with the other Leverhulme Network participants, where I listened to fascinating and impassioned debates about what is and is not known about the zone. It was clear that even though thirty years has passed, biologists and ecologists know much less about the aftermath of Chernobyl than I anticipated. The problem is that people generally do not spend much time in the zone. There are tourists, like me, who go in and see the butterflies hopping among the flowers, hear the wolves howl at night, and watch the frogs jump on and the fish swim beneath lily pads in the Pripyat River and think about how beautiful it all is. In fact, at times, I was lost in the sheer natural beauty of the Pripyat River and the surrounding forest. I would turn my face to the sun and begin to take a deep breath of the fresh air, before remembering that I was in a highly contaminated region. This disconnect—the idea that a place so polluted can look and smell and sound so normal and even beautiful—is hard to reconcile. It is a paradox I have written about for The Otter before. It is easy to see all that and walk out and think, “If this is the worst that can happen with nuclear power, it’s not a big deal.” This thought, however, is dangerous. It is, I think, one of the biggest dangers associated with Chernobyl’s transformation into a tourist destination. Radiation is sneaky. It tricks the senses. It makes us look at pictures or even look at a place itself and think we know the whole story when we do not. In fact, the whole story is not coming out of Chernobyl. As Dr. Anna Osypchuk from the National-University Kyiv-Mohlya told us, the information that Ukrainian scholars collect about the aftermath of the accident is not leaving the country’s borders. The dissertations on the topic sit in libraries (they are not digitized) where they are not read and disseminated, and so the conversation has been stunted. Dr. Kate Brown a Professor of History at University of Maryland Baltimore Country who has written about Soviet and American nuclear history, gave a presentation in Kiev during the Leverhulme Chernobyl workshop in which she argued that there has been an international effort to curtail the global concern about the accident by covering up some of its effects (the same argument can be read here). Tourists run in and out of Chernobyl and proclaim it safe or beautiful. They forget that clear water is not safe water, sweet smelling flowers can still be toxic, a howling wolf is not necessarily an unaffected one. The thirtieth anniversary of Chernobyl came and went this past April, with many of us, myself included, thinking we knew what happened and understood the consequences, at least to some degree. I came out of the zone with a different perception. This past year was not it was not the thirtieth anniversary of the accident. The accident is still happening even if it does not look that way, and we still don’t know the true scope of it.